Qualifications : Human Remains Detection. Non-SAR trick: He could wave with his left paw & he "mothered" kittens. Notes: "Legion was a great part of our team. 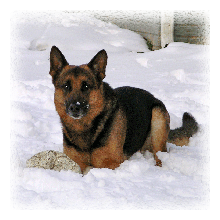 Jen brought him to us in March 2000 and trained and certified him in Human Remains Detection. He responded to numerous searches. As well, he attended demonstrations such as the CFC events and large county fairs like Celebrate Fairfax. He retired in 2009 after he started having balance issues. His mind was still sharp as ever, even right up to the end, but his body would not let him do what he wanted to do. He was a gentle dog that loved ice cubes and vegetables and of course a Gappay ball being kicked his way. During his time, he impressed many people that met him; be it SAR family, Law Enforcement, and civilians alike. In 2008 Jen and him (along with several others) were recognized by the Fairfax County Police Cold Case Squad awarding them an “Outstanding Performance Citizen Award” at a county board of supervisors meeting for their work with helping to resolve several cold cases of missing persons (pictured)".-David Wyttenbach. Legion retired due to a health issue.